ASF NOT WANTED! 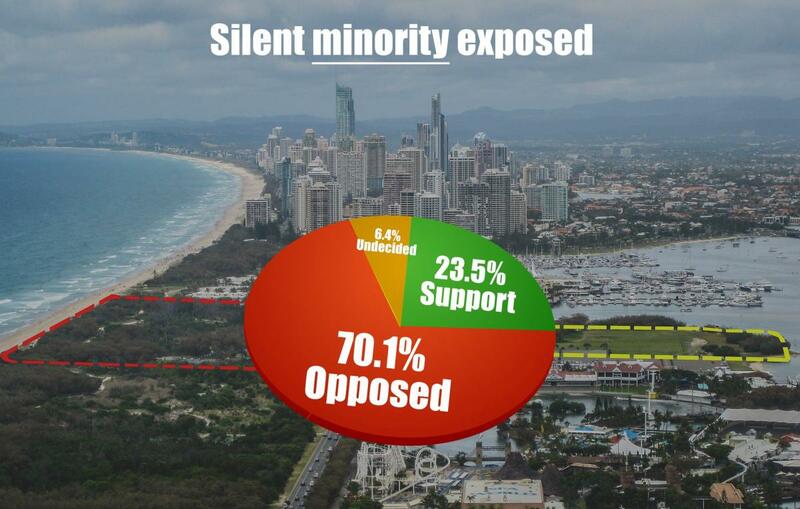 And this is the so called all powerful "silent majority" that a select few agitators such as Mayor Tom Tate and the "Jobs For Our" fake campaigns keep banging on about. Well it's clear that the claims are nothing but the fakest of the FAKE!!! Where's your "silent majority" now Tom? OVER 70% OPPOSE ASF CHINA CONSORTIUM'S PLAN for a massive highrise and casino precinct on public Crown land on The Spit. A rock-solid Reachtel Poll of Gold Coasters conducted on Friday evening last week recorded an undeniable result - OVER 70% OPPOSE ASF CHINA CONSORTIUM'S PLAN for a massive highrise and casino precinct on public Crown land on The Spit. "Do you support or oppose giving public land at The Spit to the Chinese-backed ASF Consortium to build five high rise buildings up to fifty storeys, including a casino?" Short answer is: Gold Coasters massively DO NOT SUPPORT THIS! It is clear why they will not release their own results and they are protecting ASF. The State Government conducted a similar poll late last year and have steadfastly refused to release the results to the public, despite being funded by and belonging to the public. It is clear why they will not release their own results and they are protecting ASF. The result has exposed the fact that the current and former State Governments are engaging in subterfuge, manipulation and misdirection to serve the interests of a foreign consortium exceedingly far and ahead of the public whom they are supposed to represent. Once again, congratulations to Save Our Broadwater and MBA for funding and conducting this poll that exposed the damning truth for all to see. Hot Tip: it appears that Philip Park is being prepared to be set on fire during the next hot spell and strong southerly winds. 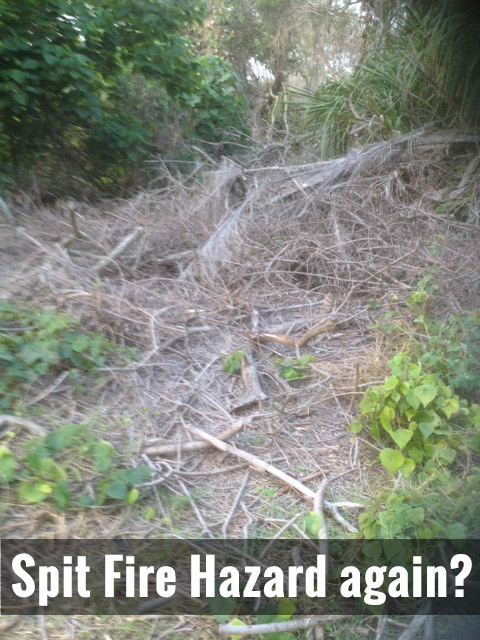 A SOSA supporter who walks through Philip Park most mornings caught Council workers stockpiling dead branches and cutting down live branches before throwing them onto several bonfire piles dotted throughout Philip Park. When questioned, the Council worker stated that they were given orders "from on high to pile the branches up" rather than remove them and quipped, "what does it matter because The Spit burns every couple of years and there will be a casino on Philip Park soon anyway." This conversation was recorded on the SOS supporter’s phone. Tate's ocean-side cruise ship terminal fantasy off Philip Park was recently blocked by the Federal Government when the GCCC Environmental submission (under the EPBC Act) was deemed to lack any technical or factual rigour. No doubt it will also be stopped by the Qld Government when the GCCC Director of Major Projects, Darren Scott, presents them with his ludicrous versions of Navigational Safety, Docking Feasibility and Business Case reports that have been prepared (cooked up?) by ASF China Consortium's major partners - PWC, AECOM and MacroPlan Dimasi. These companies were 'carefully' chosen by Mayor Tate and Council Officers for the $865,000 ratepayer funded 'cruise terminal feasibility studies'. Two days before Tate announced his Spit ocean-side cruise terminal in the summer of 2015-16, The Spit was set on fire by professional arsonists as determined by the police and fire authorities at the time. Don't be surprised if Philip Park is set alight during the next hot-weather spell after Tate's Philip Park ocean-side terminal is defeated. Some coincidences are just too hard to ignore and professional arsonists have a habit of trying to burn down The Spit (unsuccessfully) and the heritage-listed Humphries Boatshed (successfully) to enhance the chances of the sites being made available to private interests and for commercial developments. And More: If Tate cannot proceed with his Philip Park CST proposal, the current 'Bloc' of LNP 'Independent' Councillors have signalled to him that they would back a CST in the Seaway at the northern end of Doug Jennings Park. It's Time: The Local Government Minister has a duty to immediately halt all Mayoral fantasies, GCCC major development approvals and GCCC/State asset sales on the Gold Coast until the CCC investigations are completed and recommendations for prosecutions are announced. Otherwise irreversible decisions are being made by a potentially illegally-elected Local Council and Councillors. The Auditor General also has a duty to conduct a serious and detailed investigation into GCCC Finances/Expenditure going back to 2012 when Tate and the original LNP 'Bloc' of GCCC Councillors were first elected. SOSA has been advised by a retired Auditor General that in other States of Australia this procedure would have already commenced given the dubious and numerous overseas trips undertaken by the Mayor and GCCC officers in the company of development industry characters and private business lawyers, in addition to the suspected misuse of the GCCC ratepayer 'land-acquisition' levy. EXPLOSIVE! 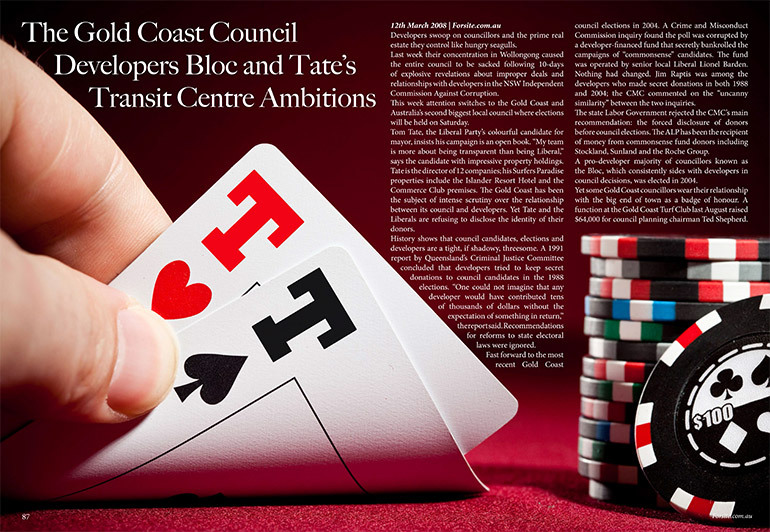 Wonder why Tom Tate is ferociously wanting to sell off the Transit Centre site that is adjacent to his own investment property? Why is he viciously defending council's highly questionable decision to sell the site - a public park which was gifted to the people of the Gold Coast in perpetuity (i.e. forever) - to explicitly remain publicly-owned parkland for the benefit of the public?